The result is a potentiated Cordyceps. A better Cordyceps. An ideal formula for those wanting to gain the benefits of Cordyceps and to include Cordyceps into their daily routine. Cordyceps is one of the most popular tonics and restoratives, with a written use dating back nearly 1500 years. In times past, Cordyceps was reserved—because of its then extreme rarity—for use by the royals, by emperors, and their families and other elites. It is only in recent memory that the cultivated of Cordyceps has become possible, making its benefits widely available. Today, Cordyceps remains one of the most powerful tonics available, ranking high up on the list with wild Ren Shen (Chinese Ginseng), Lu Rong (Silka Deer Antler Velvet), and Ling Zhi (Reishi, Ganoderma lucidum). Dang Shen (Codonopsis) (10:1 concentration) Extract (150 milligrams). A proprietary formula by RAW Forest Foods, the leaders in tonic, adaptogenic, and pro-androgenic herbs. 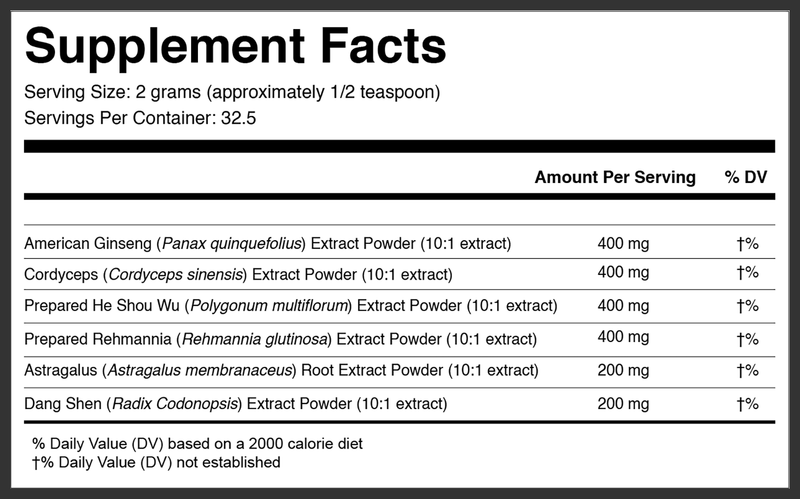 View our Eternal Well Cordyceps Formula quick facts PDF. Throughout its extended use, continuing—and garnering even more momentum—through today, Cordyceps has been renown as an anti-aging, restorative, and renewing tonic, which includes building/strengthening sexual and physical vigor, mental clarity, and to improve (modulate) the immune system. * Cordyceps builds Jing and is an excellent tonic. Within Chinese Medicine (TCM and Classical), Cordyceps have been used as a master tonic and panacea reserved for use by the Royalty because of the historical rarity of the fungi. The first written documentation of the medicinal purposes of Cordyceps dates back to 620 CE. In this first documentation, Cordyceps is written about as allegory, where the mysticism of the fungi is viewed through its transformative properties: moving from animal to plant and back to the animal. Cordyceps is considered to be a transformational herb (an opinion we agree with at RAW Forest Foods). Today, Cordyceps shares its importance both to its use within alternative medicine and within Western scientific research (which has tended to focus on its ability to promote athleticism). In all traditions of Chinese Medicine, herbs are never taken alone. Formulas are created around a particular herb or around an intended action. In this long tradition, we have created a proprietary formula around premiere, organically grown Cordyceps (Cordyceps sinensis) extract, highlighting and building upon everything we love and are drawn towards in Cordyceps—in short, taking Cordyceps and turning the volume up to eleven. Codonops is adaptogenic and restorative and contains similar compounds as American and Chinese Ginseng. Although similar American Ginseng, Codonopsis (Dang Shen) is cooling in nature and is easier for the body to assimilate then Chinese Ginseng (which can consume Qi—not add Qi—because of difficulty to assimilate). Codonopsis tonifies Spleen Qi and Lung Qi, which allows the body to better utilize the other herbs in this formula. Possibly best known for its reputation to store gray hair to its original color and vigor, He Shou Wu is one of the primary Jing tonics, due in part to the plant's ability to accumulate and concentrate Qi in its roots. He Shou Qi is considered non-stimulatory, yet able to enhance energy over time. He Shou Wu is used to strengthening the knees and lower back, the restore youthful sexual drive and function (both in women and men). * He Shou Wu contains antioxidants, supports liver and kidney function (thus detoxification and blood cleansing), and to increase SOD levels. * He Shou Wu contains high levels of bio-available zinc, an essential mineral for male reproductive health. Every package of our Eternal Well Cordyceps Formula contains 65 grams of prepared, clinical grade extracts of certified organic Cordyceps (Cordyceps sinensis), American Ginseng (Panax quinquefolius), Astragalus Root (Astragalus membranaceus), Dang Shen (Radix Codonopsis), Prepared He Shou Wu (Fallopia multiflora), and Prepared Rehmannia (Rehmannia glutinosa). Each package contains the outer, resealable opaque outer pouch to help protect the contents from UV degradation, and an inner resealable pouch to promote freshness and usability. All packaging is food-grade and done domestically. In each 65 gram pouch, there are approximately 32.5 servings of Eternal Well Elevated Cordyceps. The first time I used it was in my chaga tea before going to bed, and I actually felt the effect - similar to that of the Brassica Pollen. Haven't felt it like that again, but because of the experience, know it's beneficial.